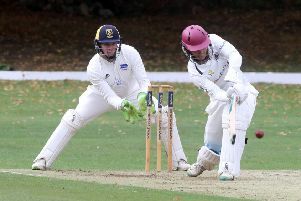 Joe Higgins cracked 99 for Castor at Sawston & Barbraham. Ketton’s perfect winning record in Cambs Division One ended in bizarre fashion against Ramsey at Cricketfield Lane today (July 29). In a thrilling top-of-the-table contest Ramsey reached the final ball one short of Ketton’s 258-5. Ashley Rodgers hammered 94 for Ketton at Ramsey. Elliott Cafferkey struck the last delivery into the stumps at the bowler’s end. The ball ricocheted to cover as Cafferkey and fellow batsman Mark Saunders turned for the second run to win the game. The fielder’s thrown then soared over the wicket-keeper’s head enabling Ramsey to complete victory by three wickets. The match featured some outstanding batting with Peter Rowe (96) and Ashley Rodgers (94) putting on 182 for the first Ketton wicket and Ryan Smith (100) and Jordan Cafferkey (60) opening up with a century stand for Ramsey. Ketton had won their previous 12 Division One games and still hold a healthy advantage over Ramsey at the top. Wisbech are third after a tougher-than-expected 23-run win over bottom club St Ives. James Williams (60), Josh Bowers (58) and Gary Freear (46) did the bulk of the scoring in the Fenmen’s 233. Freear and Jamie Gollands each claimed three wickets as St Ives replied with 210-9. Mohamad Shifran (3-22 & 60) was again in sparkling form for Nassington, but the villagers were still beaten by 53 runs at home Eaton Socon, while March look set for relegation after a seven-wicket beating at Waresley. Castor were stuffed by the weather at second-placed Sawston & Brabraham. A marvellous 99 from Joe Higgins (he was run out after a mix-up with skipper Reece Smith) helped push Castor up to 198-7 in their 50 overs. Sawston were reduced to 89-8, but recovered to reach 139-8 from 29 overs when play was abandoned because of heavy rain. Castor appeared to be on top, but the home side were awarded the victory by virtue of a superior run rate. Ufford Park were skittled for 79 at Great Shelford who went on to win by five wickets. Josh Biley struck 36 for Ufford at number nine. They had been 32-8 on a difficult track. Ramsey 259-7 (R. Smith 100, J. Cafferkey 60, E. Cafferkey 23no, S. Cafferkey 23, M. Cafferkey 20, I. Saxena 2-30, Z. Manzoor 2-52, T. Sole 2-60). Eaton Socon 218 (M. Shifran 3-22, R. Morris 3-54, T. Norman 2-38). Nassington 165 (M. Shifran 60, A. Laud 36, C. Craig 26). March 138 (T. Phillips 44no, S. Saberton 23, C. Bricker 23, M. Ninneman 4-26, J. Smith 3-9). Waresley 139-3 (J. Angleberger 50no, N. Taylor 38, A. Scully 24, S. Saberton 2.46). Wisbech 233 (J. Williams 60, J. Bowers 58, G. Freear 46, N. Kumpukkal 3-33). St Ives 210-9 (M. Askew 86no, J. Gollands 3-38, G. Freear 3-44). Ufford Park 79 (J. Bailey 36, A. Stafford 4-17). Great Shelford 82-5 (J. Bailey 2-20). Castor 198-7 (J. Higgins 99, R. Smith 25). Sawston 139-8 (A. Steels 3-33, S. Dockerill 2-32, R. Evans 2-37).